So we’ve finally done it, most of the work that we wanted in for our 3.0 LTS release of all LXC/LXD/LXCFS repositories has been merged and we’re now focused on a few remaining tweaks, small additions and fixes with a plan to release the final 3.0 by the end of the month. With all of this activity we’ve also had to update all the relevant packaging, moving a bunch of stuff around between packages and adding support for all the new features. This week, the entire LXD team is meeting in Budapest, Hungary to go through the list of remaining things and make progress towards the final 3.0 release. Fixed a race condition in the lxd import test. Expanded our user-agent to report some important LXD features. Fixed perf.sh breakage following merging of the clustering branch. Fixed console handling following changes in liblxc 3.0. Fixed the clustering documentation to match current field naming. Updated the Makefile in preparation of LXD 3.0. Changed unprivileged container not to drop any capabilities (as they are relative to the userns). Fixed a race condition in the LXD clustering testsuite. Fixed incorrect liblxc version parsing of beta releases. Fixed a regression in lxd init when configuring clustering. Removed lua-lxc, python3-lxc and lxc-templates, added configure flags. Simplified the console logging API. Made naming of ptys/ttys/consoles consistent. Removed filesystem mounting code from static init. Did some cleanups of the terminal handling code. Fixed a typo in liblxc. Fixed handling of kernels without setns support. Updated Japanese documentation for lxc.console. Made some updates to the coding style document. Added a workaround to build on older libcap versions. Fixed a test failure on s390x. Uploaded python3-lxc 3.0.0~beta1 to Ubuntu 18.04 and PPAs. Uploaded lxc-templates 3.0.0~beta1 to Ubuntu 18.04 and PPAs. Uploaded lxcfs 3.0.0~beta1 to Ubuntu 18.04. Uploaded lxc 3.0.0~beta1 to Ubuntu 18.04. 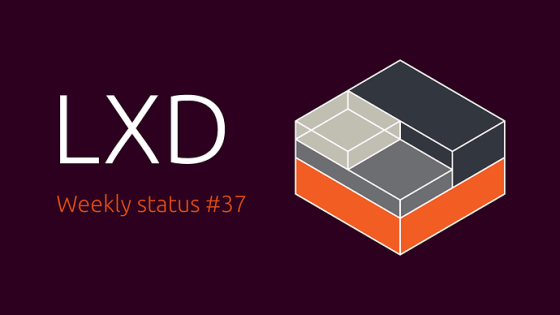 Uploaded lxd 3.0.0~beta1 to Ubuntu 18.04. Uploaded lxd 3.0.0~beta2 to Ubuntu 18.04. Several follow-up updates as we move content between packages and get automated tests to pass again. Updated edge packaging to support LXD clustering. Updated liblxc handling to reduce build time and automatically pick the right version of the library. Created a new beta channel using the latest beta of all components.